"First, before my daughters / I saw Alzok lead her sisters through the eye / Saying, death will be our coven." Alzok Däl is a Hive Wizard that appears as a boss in the Court of Oryx. She is accompanied by her two sisters Gornuk Däl and Zyrok Däl. The three of them have hidden their deaths in each other, so they "Will never be alone". The three sisters are a boss in the Court of Oryx. They spawn in together and will starts to spread out from the portal, spawning waves of lesser Hive. While each individual sister is not particularly strong or hard to kill, they will revive after a short while if even one sister is left alive. All three must be killed within a short window in order for them to all stay dead. While a sister is dead, they leave behind a large green pool as a visual cue they are down. 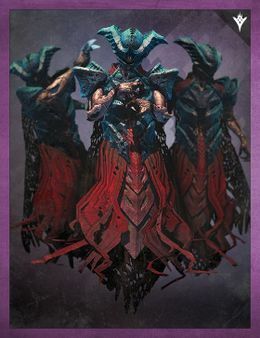 The way the sisters hide their deaths is based on the concept of an Oversoul, developed by Oryx's Daughters, Ir Anuk and Ir Halak.